Once you've found an item in the catalog, you need to know which library it is in. 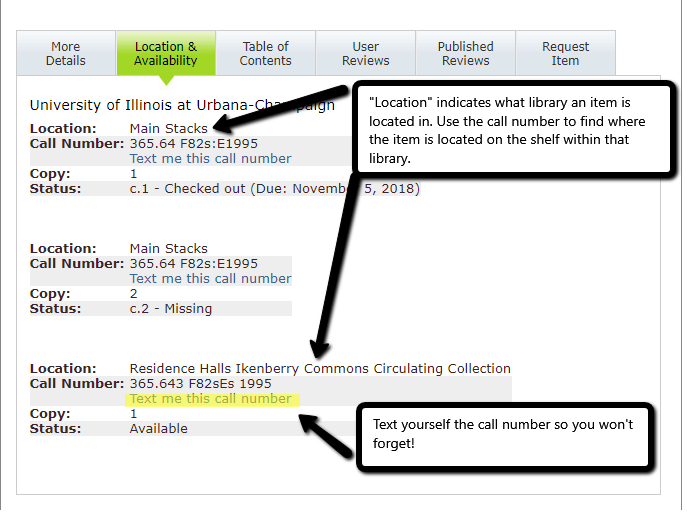 Location: Indicates what library an item is located in. For example, there are copies of the book above at both the Main Stacks and the Ikenberry Residence Hall Library. Call Number: Where on the shelf an item can be found. Libraries on our campus use Library of Congress (LC) Classification and the Dewey Decimal system to organize materials. For more information see the infographics below. Copy: In the example above, the University of Illinois at Urbana/Champaign owns three copies. Copies 1 and 2 are at the Main Stacks (although copy 2 is missing). Copy 3 is at Ikenberry's library. Status: Shows whether a book is available to check out or not. Available - The item is on the shelf. Most other statuses (e.g. damaged, in process, overdue, missing) mean that the item is not available. If there is not a copy available on campus, try searching for the item in I-Share. If you have any questions, don't hesitate to Ask a Librarian! The first section is always in alphabetical order. H is before HA. And HA is before HB. This number is always in numerical order. 15 is before 155. And 155 is before 158. This section is alphabetical by the letter and then numerical by the number. A is before A5. And A5 is before A7. This section is alphabetical by letter and numerical by number. The first number is always in numerical order. 812 is before 813, and 813 is before 814. This number is also always in numerical order. Treat it like a decimal number. .12 is before .13. and .13 is before .136. This section is alphabetical by the letter and then numerical by the decimal number. F97 is before G32. G3 is before G32. And G32 is before G33.